Making Math Happen in the Junior Years , a new release from ETFO, provides teachers with a vast array of ideas to incorporate into their math program. It is the second in ETFO's Making Math Happen series. In this issue of Voice, Jennifer Paziuk, one of the lead authors, describes the importance of communication in a successful math program. An excerpt from the curriculum provides further ideas. During her 15 years as a teacher, Jennifer Paziuk has become a math maven - or, more, a maven of math instruction. Paziuk had always liked math but took her undergraduate degree in science and French. Today she is a math specialist (she took her training while on maternity leave), and she is one of the lead authors of ETFO's math curriculum, Making Math Happen in the Junior Years . It is the second book in ETFO's Making Math Happen series. "Math became a real interest for me when my eldest daughter started school. I was trying to help her learn and really understand rather than memorize-I wanted her to really understand the math," Paziuk says. That experience helped transform the way she approached the subject with her own classes. She became more and more convinced of the importance of talking about math and enabling her students to do so as well. "When children can talk or write about something, they have learned it. It's like when you have to teach something -that's when you know if you really understand it," Paziuk says. One of the mainstays of Paziuk's teaching strategies is the math journal in which students communicate their thoughts about a math activity. To begin, she asks them to talk or write about what they did, what they learned, and what they have questions about. "It is important to do a lot of modelling in the beginning," Paziuk says. "The students talk and the teacher models how he or she would put together a journal entry." As the year progresses, the focus of the journal is varied to include a variety of writing: "How to" instruction, creative writing, reflective writing, explaining a solution. This is a particularly effective strategy in her grade 6 class, Paziuk believes, because students that age are more reluctant to ask questions in front of the whole class. Students who are identified as having learning problems or who have English as a second language are especially reluctant to do so. "They are already self-conscious. They often write that they need extra help. This way they can ask in private." "When first starting out, it is important to offer prompts or sentence starters," Paziuk says. As well she does a lot of pre-talking with her class. This helps students verbalize and clarify their thoughts before they are asked to write them down. "At the beginning of an activity I give the students a focus: for example, looking for patterns in data. I ask them to think about the math language they find themselves using or specific strategies they used to solve the problem. As a result of having a focus, during our class discussion students are able to answer these questions with more detail. "We also brainstorm for strategies that might work and previous problems that are similar that might help us decide on a strategy. I create a strategy wall with them that stays up during the year, and we add to it as the year progresses." She also has word wall in the classroom. "Because space is limited, I post a new chart for every unit. As students are working on an activity, they are asked to focus on the math language they find themselves using. These words are added to the word wall during our discussion time. It becomes a word reference sheet for that unit." Students also keep a "things I need to work on" list at the beginning of their journal. Each time students receive feedback from their peers or their teacher, they add the ideas to their list, and it becomes an individualized learning plan for them. "Giving productive feedback is one of the most important things a teacher can do. Stating simply, 'Good Job!' does not give the student enough information. What was good? Let them know and they will be sure to repeat it." "The most important thing to remember is that the effort of integrating a communication component into your math program is worth it." Here is an excerpt from Making Math Happen in the Junior Years . Communication in its varied forms (e.g., reading, writing, speaking) is a tool to help students think about what they are learning. In language arts, students go through the writing process, which includes brainstorming, prewriting activities, drafts, conferences, etc. All of this leads to a final product which is hopefully clearer than when the process began. Students also learn to use story maps to organize their thoughts when communicating about what they have read. It should be the same when communicating in mathematics. Students take an idea and go through a process to express it in a clear manner. The difference is that the focus is on the mathematical reasoning. The main reasons for including communication as part of a mathematics program are to help students make sense of what they are learning, and to help the teacher understand what the students are learning. As well, teachers have the opportunity to discover any misconceptions that students might have and can assess attitudes towards mathematics. At first oral communication is the main vehicle for expression, as written communication may not be adequate to give a clear picture of what students have learned. However, throughout the junior grades, as students' communication skills improve, they will be able to use an increasing variety of strategies for demonstrating what they know. In all cases, students should be provided with opportunities to verbalize their ideas before recording them in a written format (e.g., writing in a math journal). Think-Pair-Share is an excellent strategy for fostering oral communication in math class. 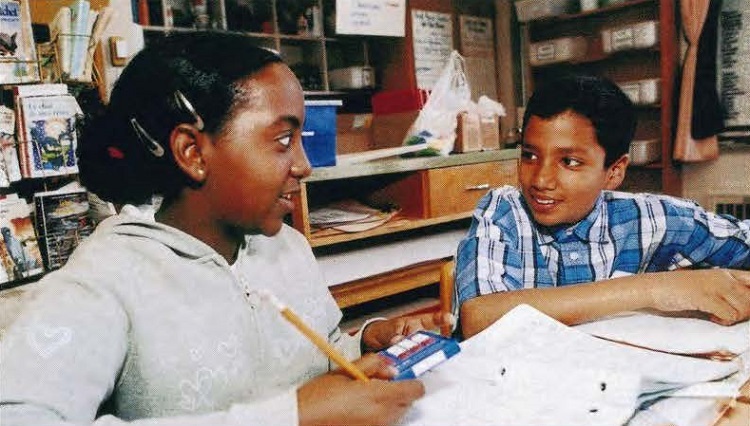 Many other co-operative group strategies, such as Round Robin and Jigsaw, can also be incorporated in math class to promote the sharing of ideas. To create an environment for effective communication, it is important to schedule math periods so that you have large blocks of time. You may have to be creative in your scheduling, but it is very difficult to have meaningful opportunities for communication if you only have short periods of time. It is ideal if you have a 60-minute block each day. It is very important to set the tone of your classroom right from the start. If we want our students to improve their communications skills, they must be given the opportunity to communicate. If we want them to see the importance of communication, we must show it to them. The teacher's role in promoting verbal communication in the math class is critical. Teacher modelling of "thinking aloud" throughout the problem-solving process provides students with an idea of how to describe the mathematical reasoning that occurs as they try to solve problems. Students need to get comfortable talking about math before they can progress to writing about it. Therefore, when first starting out, it is important to have lots of time for "math talk." Instead of having students write their ideas down, have the students talk about them. One way to get students talking about math is to invite them to work in groups to discuss what they have learned. Afterwards, each group can be asked to share its ideas and ask questions for clarification in a wholeclass discussion. In the latter case, the teacher should act as a recorder, and create a "class journal." Modelling serves the purpose here of allowing students to see how orally expressed ideas can be translated into writing. The journal (and others that are created) should be posted in the room for future reference. Math talk should be an important part of every math class! A way to encourage ongoing math talk is to use a gimmick, such as wearing a visor with a math "question of the day" on it (e.g., What strategy did you use?). Explain to the students that they will need to answer that question when you come to their group. This type of prompt helps students focus their learning, and discuss specific aspects of mathematics. The following are more suggestions to get the math talk flowing. Start building a math word wall from the first day of school and keep adding to it throughout the year. You could also create a word wall for each new unit if space is limited. Have students discuss vocabulary that they used while working on an activity. Let them add it to the word wall. Word walls can take different forms and may include mathematical words only; mathematical words and definitions; or mathematical words, definitions, and examples or diagrams to demonstrate meaning. Model math language by constantly making students aware of the math words they use in conversation outside of math class. For example: "Mark, you used the word 'chance' when talking about your team in gym. What is meant by 'chance' and where do we use this term in mathematics?" Post a "question of the day" on the board or use a gimmick such as wearing a hat or carrying a sign that displays a question. Try to use openended questions such as: "How did you do it?" or "How did you know?" Tell students that this is the question they will have to answer when you arrive at their table. This helps students focus their discussion while working. Give students the opportunity to share their strategies orally with the class. Explain: "In math you can use different strategies and still come up with the same answer." After a number of strategies have been offered, ask which strategy the students preferred, and have them explain why. All strategies are not created equal, so it is important to guide students to the conclusion that some strategies are more efficient than others. Invite students to create their own problems, either on their own or with other students. These could be extensions of problems they worked on during class, or problems that they thought of because of other activities. Students could then be asked to trade their problems with other students and solve them. Discuss solutions as a large group. Above all, encourage math talk when students are working. Your math class should not be silent! Making Math Happen in the Junior Years was written by Jennifer Paziuk, Susan Pitre, Ruth Dawson, Joanne Languay, and Vfike Davis. Contributing authors were jane Bennett, Jason Johnston, Troy Parkhouse, and Roz Thomson. The book is available from shopETFO at a cost of $17 (plus GST). To order online go to www.etfo.ca, click on "Publications" and follow the links.